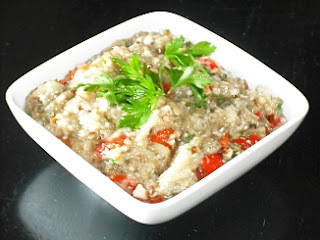 We have previously published the recipe for Eggplant Dip (Melitzanosalata), but this is a delicious variation with walnuts, red peppers and mastic. A wonderful accompaniment for your meal! Poke some small holes in the eggplants with a fork and place them in an oven dish. Cut off and discard the top stem from the peppers, as well as the seeds and place them in the oven dish with the eggplants. Roast them for approx. 30-40 minutes, until the peppers have started to turn black, so that you are able to peel them. The eggplants should also have started to turn black and if you tap them with your finger, you’ll hear a hollow sound. Peel the peppers and cut them into small squares. Peel the eggplants, sprinkle with the lemon juice and a little salt and leave them in a colander to drain. When they have drained, chop finely and add the peppers, walnuts, mastic, yoghurt, vinegar and olive oil. Mix, add salt and then leave in the fridge for 1 – 2 hours. 12 eggplants???? for how many people is this for?? ?